If you need to remove contacts who were imported together, you can undo the import on the audience’s Import History page. 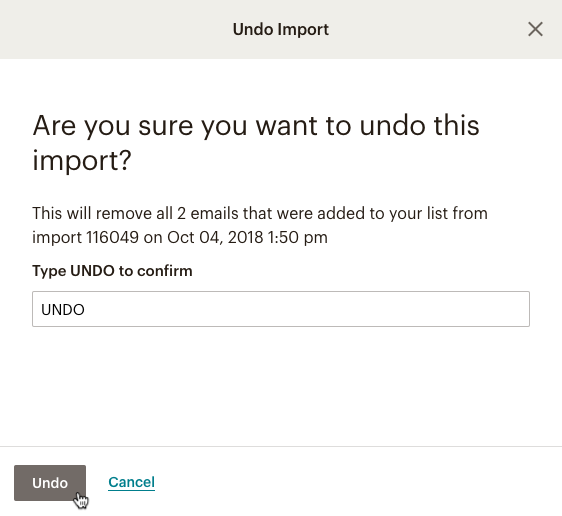 In this article, you’ll learn how to undo a contact import. To import or export contacts, you need an audience in Mailchimp. To learn more, check out Getting Started With Audiences. After you import contacts to an audience, we’ll tell you if there were any errors, and which addresses were affected. Then, you can undo the import, remove the affected addresses, and redo the import. To learn more about how to resolve issues with your import, read Troubleshooting Contact Imports. You can undo a contact import at any time, for any reason. When you undo an import, you’ll only remove contacts who were added by that import. You won’t remove contacts who were in your audience before the import, and you won’t revert any field data that was updated for existing contacts as a result of the import. To undo your contact import, follow these steps. Find the import you want to remove, and click Undo. In the Undo Import pop-up modal, type UNDO and click Undo. After you confirm the action, the import will display an Undone timestamp on the Import History page.